BendPak’s HDS-35 four-post car lift is not to be trifled with. This heavy-duty lift handles Class 8 - 9 trucks and equipment, which includes full-size flatbeds and construction equipment. The extra hoist capacity means that drivers may not need to unload cargo before lifting their trucks. While BendPak’s HDS-27 series offers good four-post truck lift capability, the HDS-35 series is where you go when circumstances demand a car lift with extraordinary strength and incredible versatility. For instance, a flatbed truck that weights 11,340-kg. may actually overload the HDS-27. It all depends on the distribution of weight on the vehicle’s axles. That’s where our HDS-35 models come in handy. Simply put, bigger sheaves and sheave axles make for a sturdier, safer and more powerful lift. We build our four-post lift sheaves 305 mm in diameter, accompanied by 102 mm diameter sheave axles. Functional sheaves are essential to a smooth rise, so you can expect low-maintenance and high-functioning parts for many years to come. Our 19 mm diameter, ​153 mm x ​635 mm ​galvanized lifting cables have a ​23,133-kg. breaking strength per cable. The four cables alone, without the hydraulic cylinder, offer more than enough power to safely lift your 15,876-kg. truck. All things considered, we over-engineer our components and proudly wear our ALI Certification on the columns of our four-post lifts for all the world to see. Giant 305 mm x 305 mm base plates support all BendPak heavy-duty truck lift columns for additional support and reduced pressure during use. Wider columns make safer lifts, an absolute necessity when lifting some of the heaviest commercial trucks on the road. Get ready to lift some massive vehicles. If you need a 15,876-kg. 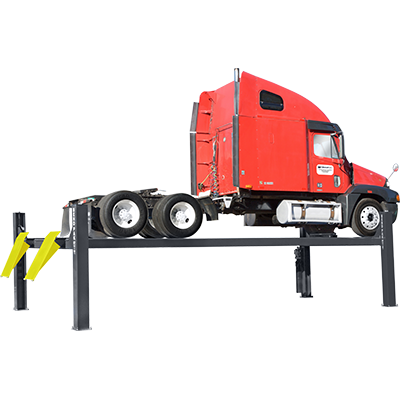 capacity truck lift that’s a little longer, the HDS-35X is just the ticket to smoothly handle wide wheel bases, extended dimensions and virtually every truck in this weight class. Email or call BendPak customer service to discuss your specific lifting needs. Always make sure you get the right car lift for your specific lifting needs.